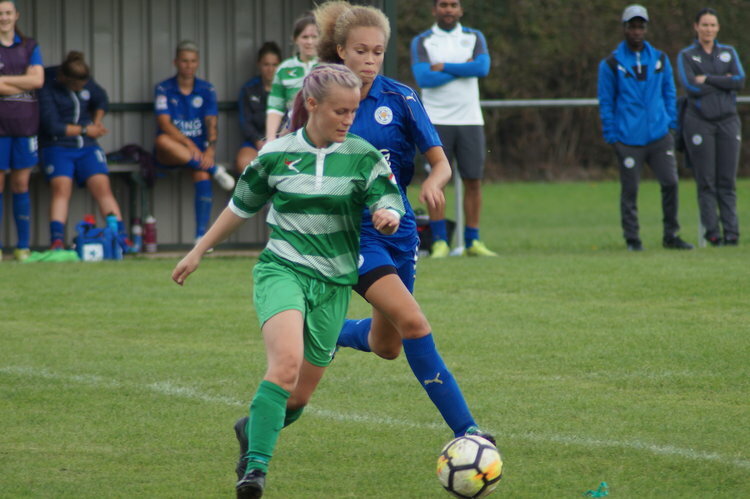 TNS Ladies were second-best on Sunday in their latest League Cup fixture, succumbing 5-2 to a well organised and slick Leicester City Women side, that brought an end to the Saints’ bright early season form. Suffering from a number of absentees due to injury, there were several changes to the starting line up from the mid-week away to Sporting Khalsa, which saw starts for Phoebe Davies, Michelle Pasco, Taylor Davies and Emma Roden. It was Leicester who started the brighter, forcing several early corners and missing a couple of good chances. So it was no surprise when the breakthrough came on 16 minutes, although in a rather fortuitous manner. A loose ball in midfield by Leicester saw action behind the TNS back line, with the winger racing through to score through the legs of the eventual player of the match, Stacey Garnham. The game seemed all but done and dusted after 36 minutes when Leicester doubled their lead, following an error as TNS played out from the back. It was only when the third goal went in on 52 minutes that TNS rallied. First Kim Bebbington scrambled a goal from a Charlotte Canlett free kick on 58 minutes before Canlett herself then slotted home a penalty 3 minutes later. Suddenly the game turned, and with half an hour remaining, TNS looked to continue the momentum. That was as good as it got though, with Leicester scoring a fourth on 72 minutes before capping the victory in injury time with a breakaway goal. Afterwards a circumspect Andy Williams reflected: “We’re naturally disappointed with today’s performance, not necessarily with the result but more the fact we never got going. We have played nowhere near our standard today, and that’s unforgivable. Some will say with the necessary changes we made it is hardly surprising, but top teams don’t hide behind those sorts of excuses. The disappointment comes because I feel some players have let themselves down today.